The new IFIC Foundation FACTS (Food Advocates Communicating through Science) Network has been connecting to new audiences and addressing hot issues in food this month, providing a source for science-based resources on timely nutrition and food safety topics to help balance the hype with FACTS. Make sure you are receiving and sharing the latest science-based FACTS resources by becoming a FACTS Follower! Sign up to join the FACTS Network, and be sure to follow us on Facebook and Twitter. “Get to Know FACTS” Infographic. 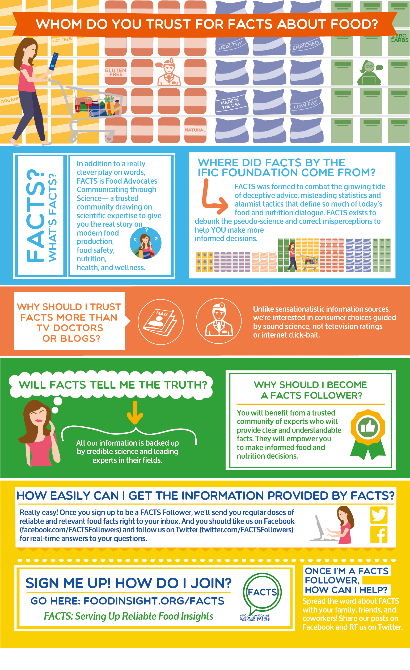 Find out more about FACTS and how you can use it to get high-quality information on food and nutrition issues in the news. “Worried about your coffee habit?” Infographic. There’s been some buzz about caffeine lately. This infographic by Compound Interest shows just how much coffee, water, and alcohol would be ‘potentially toxic’ at high doses – and it’s pretty surprising! “12 Steps for Spotting Bad Science” Infographic. Whether it’s cherry-picked results or sensationalized headlines, junk science coverage can now go into recovery with its own 12-step program. Of Mice and Media: A Credulous Response to an Iffy Sweetener Study. Read this in-depth take on the integrity of the latest low-calorie sweetener study, what we know from previous studies, and how it all got covered in the media.